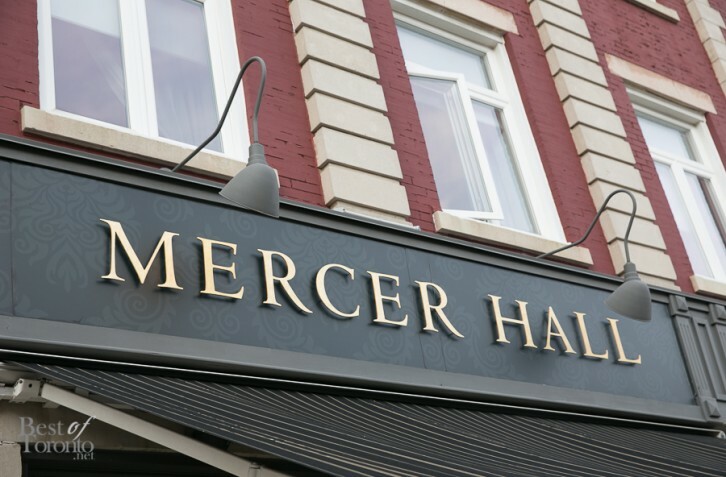 On our first night in downtown Stratford ahead of the Savour Stratford 2014 culinary food festival, we decided to visit Mercer Hall Restaurant for dinner. The charming space, which also doubles as an Inn on the second floor, carried a slight air of confidence with its high ceilings and glittering chandeliers, all the while maintaining a welcoming demeanour; case in point, the cozy banquettes that lined the walls and the warm chocolate brown glass case which stocked the restaurant’s wines. On Thursday, Friday & Saturday from 5:00pm-7:00pm, there is a prix fixe offer of either 2 Courses: $48 or 3 Courses : $54. We opted for 3 courses each. To whet our appetite, we were given their regular house made sourdough as well as their blood sourdough (yes, made with pig’s blood). The latter was my absolute favourite. 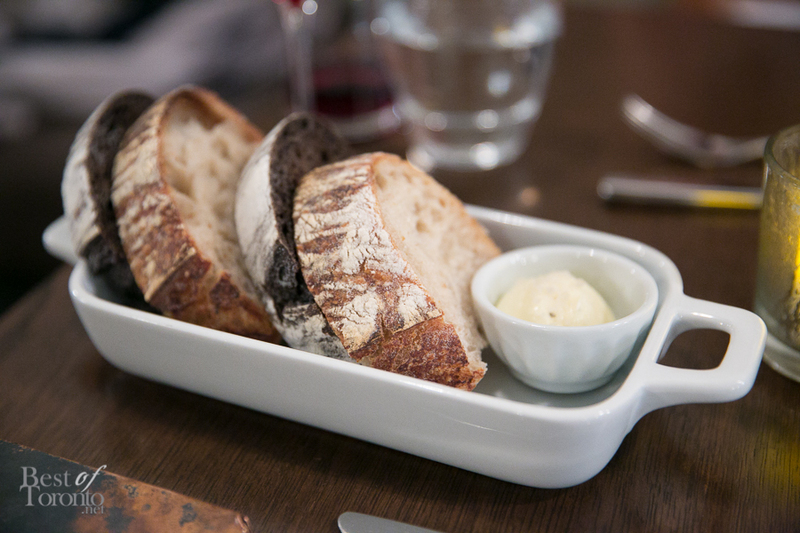 I was smitten with the tender crumb, the midnight colour, and the subdued tang brought to the bread. It had body and was our exciting foray into what the rest of the evening’s dishes held. Here are some of the delectable highlights. I delved into tender pieces of local Ontario beef, all of which were perfectly seasoned. 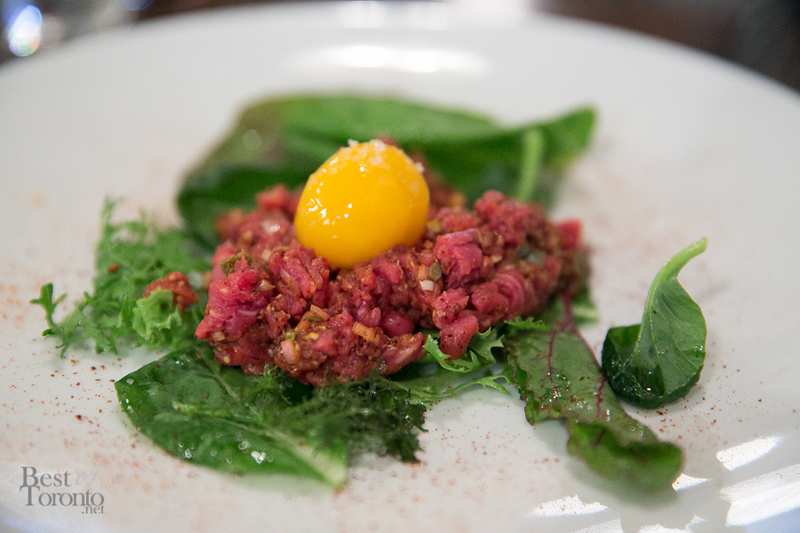 Along with roasted garlic and rustic greens, a 65 degree egg yolk was nestled atop the meat. The sunshine sphere was akin to a soft lozenge: ridiculously lush and creamy. Sprinkled with touch of flaky salt, this was beef tartare was delicious. Coral coloured pieces of house-smoked salmon were draped over shoots and sprouts.it was finishedwith dolloped of horseradish raita and crunchy kettle-style dill pickle chips. It was a beautiful marriage of tang, creaminess, and smoky-sweetness from the salmon. Crispy nuggets of Spanish style fried potatoes were tumbled into a shallow dish, then slathered with piquillo pepper & tomato mayo, topped with strands of bail and pea shoot salad, and finished with anchovy dressing. I adored the herbaceousness of the tender pea shoots but to be honest, I could have just eaten a bowl full of those tater chunks on their own. Call me a purist, but when something is executed perfectly, it should be the star and not get lost amongst the supporting cast. Basted in its own juices, while this Pekin may have come from Quebec, it definitely had a layover in China. 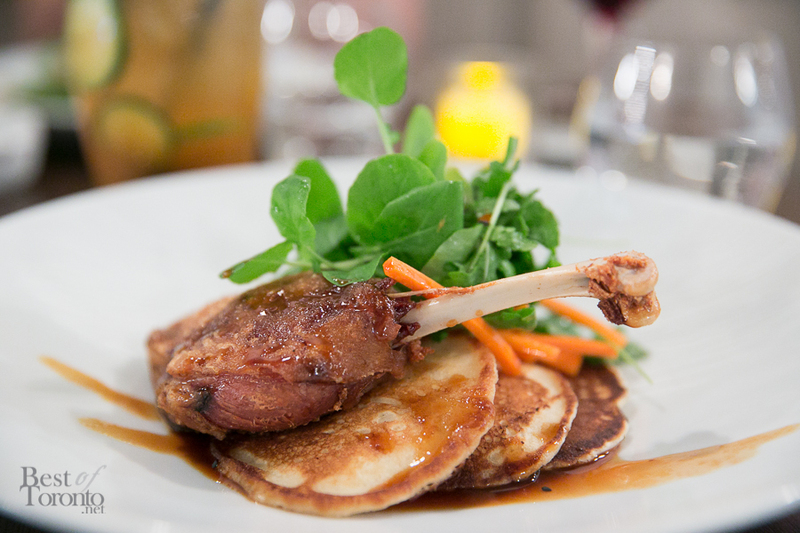 The duck was bathed in a sweet hoisin sauce and sat on sourdough pancakes– a cute little play on the traditional crepe wraps that would accompany Asian peking duck. These fluffy cushions were just the thing needed to cut the richness of the protein. Pickled carrots and watercress show the chef’s attention to flavours and balance. Aside from the duck being a bit too salty, the dish was still a winner. While my partner dined on duck, I devoured the Porchetta Belly. 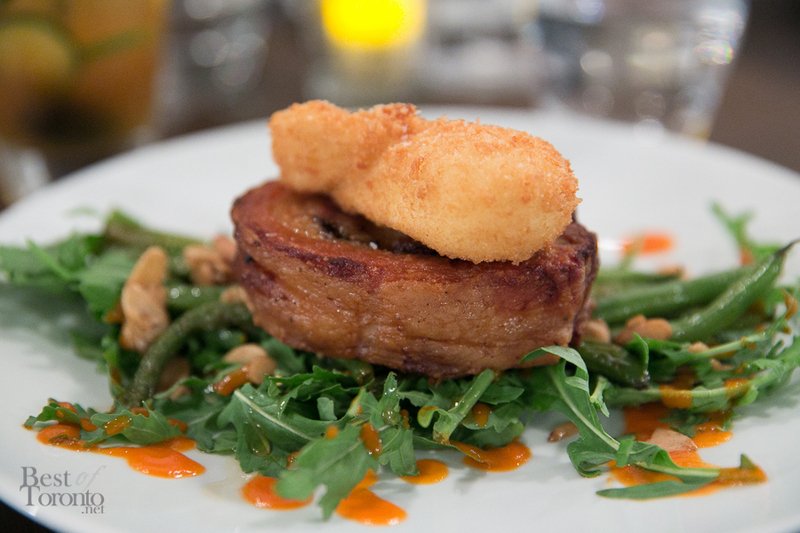 A fantastical roulade of fatty, unctuous pork sat a top of crunchy green bean spears. As if that was not decadent enough, chef topped it with a panko fried egg. Like a surgeon, I used my knife to make the smallest incision. Before I knew it, golden lava poured out– it was creamy nectar; it oozed out onto the plate and coated the greens like a hollandaise. Back to the pork belly: the exterior was charred to add more flavour and smokiness — and the interior? Divine. Layers of juicy fat interspersed with soft, sweet pork. The service throughout was gracious and informed. Kudos to chefs Tim Larsen and Sean Collins for an amazing experience. Looking forward to another visit to Mercer Hall in Stratford. Spring Garden dessert with sour cream ice cream, cilantro, olive caramel, edible flowers and more.